Growing up, kindergarten teacher Zoe McCord was a tomboy whose two best friends were guys. Now, as an adult, she must decide between the two. Lawyer, Nick Adams knows Zoe’s everything he’s ever wanted and that she holds a torch for someone else. But he's prepared to risk getting burned. Zack wants Zoe to know she’s always been the one for him. But what if it’s too late? In the midst of uncertainty, one thing's for sure: on the way to happily-ever-after there's bound to be a PITCHFORK IN THE ROAD! Publisher's Note: This series is a fun look at the serious side of life and will be enjoyed by chick-lit and women's fiction fans of Elin Hilderbrand, Kevin Kwan, Gail Honeyman and Lauren Weisberger as well as Emily Griffin. These stories are best enjoyed by mature readers. Book 1: To Hell in a Coach Bag - A wacky widow, a wild divorcee, a frustrated wife and their mid-life hormonal boss are the "lunch ladies". 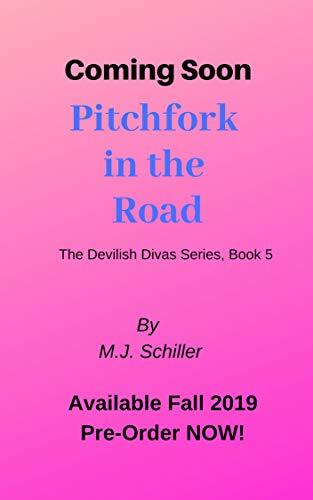 On a quest to find solace from life's disappointments and recapture their youthful spirit, Dani, Sam, Alex and Max set out on a cross-country road trip. Book 2: Damned if I Do - Dogged by past heartache, Dani returns to the hotel to win Tucker back. But her hot roadie is nowhere to be found. Picking up a few clues, Dani goes in hot pursuit, but will it be for better or for worse? Sam has pushed her man Kyle away. And when the Canadian hockey referee reappears, he faces an icy reception. Now Sam must decide if she wants to turn her "I don't" into "I do". Book 3: The Devil You Know - Lunch Ladies Dani, Max, and Alex want to make sure wedding bells ring for pal Samantha and her fiancé, Kyle, even if it requires a showdown with Sam's ex and a case of Ding Dongs to avert disaster. But first, they need to find the bride! Meanwhile newlyweds Dani and Tucker face the joys and struggles of a growing blended-family as Tucker's teenaged daughter, Zoe, who is enamored with the boy next door, enacts a plan that puts her in a risky situation. Publisher's Note: This series is a fun look at the serious side of life and will be enjoyed by chick-lit and women's fiction fans of Sophie Kinsella, Fannie Flagg, Colleen Coleman and Judith Keim as well as Melanie Summers. Having recently "tied the knot" Dani and Tucker are facing the joys and struggles of a growing blended-family when an accident turns their eager anticipation into fear. Meanwhile, Tucker's teenaged daughter, Zoe, has developed more than a passing interest in the boy next door, Zack. Zoe's plan to get out of Zack's "friend-zone" backfires and puts her in a risky situation when she "uses" Ben. Dani, Max, and Alex want to make sure wedding bells ring for their pal Samantha and her fiancé, Kyle, even if it requires a showdown with Sam's ex and a case of Ding Dongs to avert disaster. Now they just need to find the bride! It's going to take a team effort to rescue Zoe from Ben and get Sam and Kyle to the alter, because no one can hurt you quite like THE DEVIL YOU KNOW. Publisher's Note: This series is a fun look at the serious side of life and will be enjoyed by chick-lit and women's fiction fans of Sophie Kinsella, Fannie Flagg, Colleen Coleman and Sally Thorne as well as Emily Griffin. 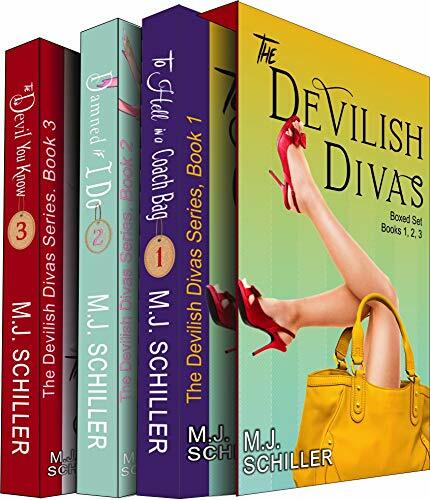 The Devilish Divas Series . . .